In the background of the box, there is a Polish flag. This is simply because Fiege Schwartzfink was from Poland. Right on top of that in the bottom left, there is a smaller photo of the village where she originally grew up, Szydlowiec. In both of the top corners, there is a flower. This is but a simple recognition of her being a girl. The bottom left also has a match propped up against the side. Because her family had no electricity or running water in their house, they would probably have had to go to a well daily, and use matches and candles instead of lights. On the top, there is a pair of shoes. This represents the fact that her father was a shoemaker, supplying the family with income. In the very front on the bottom right corner, there is a large picture of Fiege herself. When Fiege was born, in her household there were none of the comforts of life. There was no running water, electricity, or even indoor plumbing. If she had to go to the bathroom in the middle of the night, she would have to go outside to the outhouse. If she wanted light, she would have to light a match or candle, and getting a drink would require a trip to a nearby well. As hard as these conditions might seem, things only got worse for her. When she was taken to labor camps during World War II, she had none of these necessities, nor did she have enough food to eat each day. Fiege Schwarzfink was born on May 8th, 1925. For the first fourteen years of her life, she lived in a normal, if crowded, home. 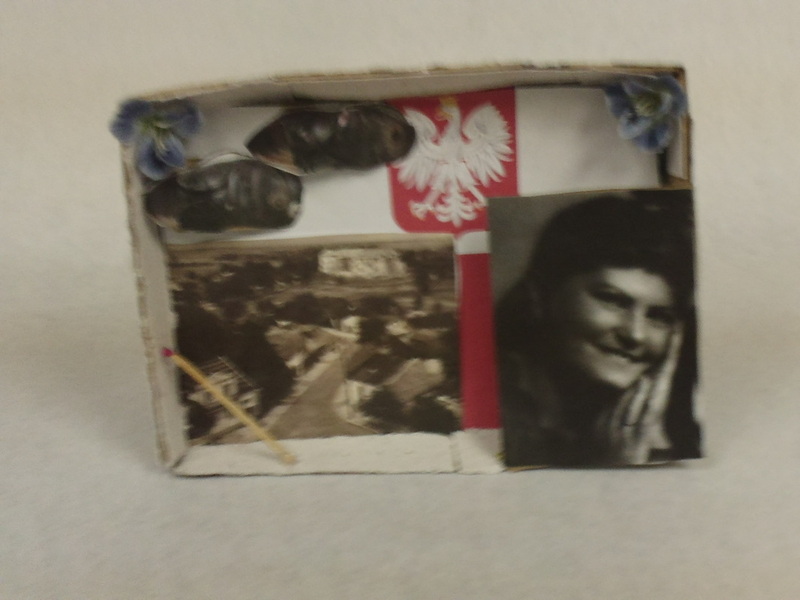 She and her family lived in the small Polish town of Szydlowiec. They lived in a small hut. It was Fiege, her parents, and her six brothers and sisters. Her father was a shoemaker, and her mother mainly stayed at home. They were religious Jews. When the Germans invaded Poland in September 1939, everyone there was impacted, mainly for the worse. Fiege and her family were no different. The Germans closed the schools in Szydlowiec, and enforced a six P. M. curfew. Things stayed that way for about three years. In November 1942, the Germans in Szydlowiec seized all of the young Jewish girls. Fiege was forced to walk to the labor camps in Skarżysko-Kamienna. Skarzysko-Kamienna was a town built around the Warsaw-Krakow and the Sandomierz-Koluszki railroad intersections. There were three labor camps located around the munitions factory there. Here Fiege was forced to work twelve hour shifts producing shells, sometimes during the day, sometimes at night on only a slice of old bread, a bowl of soup, and a cup of black coffee. Fiege, used to better food than the coffee, refused to drink it, and instead chose to use the coffee to wash her hair as it was always dirty and lice-infected. After her time in the labor camps at Skarżysko-Kamienna, Fiege was sent to another labor camp, and then to three different concentration camps. From the third whe was liberated on April 30th, 1945. After that she emigrated to the USA in 1945. Unfortunately, there is no more information about her or her family after the Holocaust.